Donald Trump has paid respects to the 23 people killed when a powerful tornado roared through a rural Alabama town. Pope Francis has sent condolences to tornado victims in Alabama and US President Donald Trump will visit on Friday. Donald Trump has declared a major disaster exists in Alabama after a tornado swept through the state and killed at least 23 people. An Alabama woman who left home to join the Islamic State group in Syria is not an American citizen and will not be allowed to return to the US, Mike Pompeo has said. 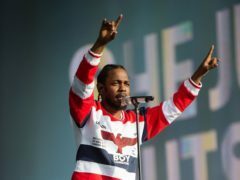 Rapper Kendrick Lamar paused a duet with a white female fan after she continually said ‘n****’ while rapping along to one of his songs. Police in Alabama have helped stage a man's arrest - so he could kneel and propose to his girlfriend.